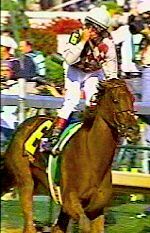 Funny Cide winner of the Kentucky Derby with a jubilant Jose Santos up. Cool and sunny weather brought out a crowd of 148,530 for the 129th running of the Grade 1 Kentucky Derby at Churchill Downs, the fifth largest ever. Although the day started off good for trainer Bobby Frankel, winning three of the undercard graded stakes and finishing second in another, he missed the big one. 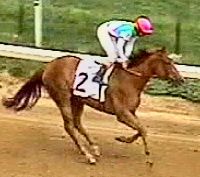 New York bred gelding Funny Cide was the upset winner with Frankel's two entrants, Empire Maker and Peace Rules, finishing second and third. Funny Cide is the first gelding to win the Derby since Clyde Van Dusen in 1929 and the first New York bred ever. Turning for home with Peace Rules at the rail, Funny Cide in the center, and Empire Maker on the outside. 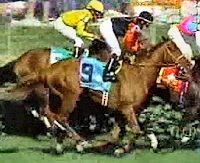 When the gate opened, expected pacesetters Brancusi and 6-1 second choice Peace Rules went to the front while Jose Santos kept his 13-1 shot Funny Cide in a stalking position in third. 5-2 favorite Empire Maker, sent off much higher than the oddsmaker had predicted, was bumped at the start but settled in an unhurried eighth racing wide throughout. The middle part of the race was mostly a duel between Brancusi and Peace Rules, who raced head to head for over 6 furlongs, setting fractions of 22.78, 46.23, and 1:10.48. 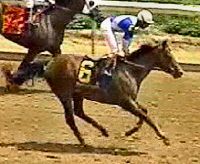 Peace Rules inherited the lead when Brancusi succumbed to the fast pace, getting the mile in 1:35.75, but was unable to hold off the late move of Funny Cide. 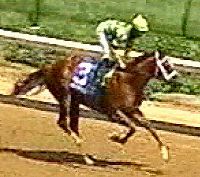 Turning for home, jockey Jerry Bailey roused Empire Maker who made headway up to third place at the top of the lane. However, the wide trip took its toll on the favorite, and he only managed to collar his stablemate Peace Rules inside the final furlong for a second place finish. 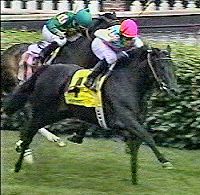 Funny Cide captured the Roses by 1 3/4 lengths over Empire Maker. It was just a head back to Peace Rules and another head back to late-closing 9-1 shot Atswhatimtalkinbout, who was forced outside at the start and suffered a seven-wide trip. The final time for the 1 1/4 miles was 2:01.19. Jose Santos celebrates his first Derby win on Funny Cide. This was also the first win for a New York bred and the first gelding to win in 74 years. Funny Cide's co-owner Jackson Knowlton of Sackatoga Stable said: "We're just the little guys in the game, we have a three horse stable of New York-Breds. This is a great day for the New York bred program and New York racing. Barclay Tagg has done just a spectacular job with this horse from day one, he picked the horse out and we bought him privately. Jose Santos has ridden him in each of his seven races, he's never run a bad race and today he saved the best and we're just excited beyond belief." Jockey Jose Santos was jubiliant after his first Derby win in seven attempts. He said: "This is an excellent horse. I can't believe won the Kentucky Derby on this horse. I guess people just didn't believe in him because he is a gelding and a New York bred. We're bringing the Kentucky Derby trophy back to New York, back home!" 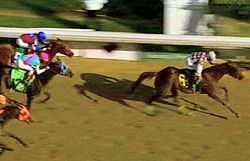 Trainer Barclay Tagg had been criticized for keeping Funny Cide in New York until Wednesday, but his strategy paid off as Funny Cide became the first winner who did not prep at all at Churchill Downs since Bold Forbes in 1976. Tagg said: "He worked at Belmont Park on Tuesday and got here on Wednesday. I guess that's plenty of time to win the Kentucky Derby. I guess we've got to go [to the Preakness] now. He gets on the plane at 10 [Sunday] morning to go back [to New York]. But, I'm not sure how I'm going to train him this time." At the wire it is Funny Cide followed by Empire Maker, Peace Rules, and Atswhatimtalknbout. 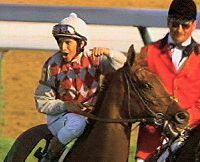 Jerry Bailey, jockey of favorite Empire Maker had this to say about the race: "When I asked him he went but he didn't go with authority like he did the last couple of races. He didn't have enough to put [Funny Cide] away. On the far turn I thought I could beat that horse like I did in the Wood, I thought I could do it." When asked about third choice Ten Most Wanted's poor finish (9th), jockey Pat Day said: "I really don't have a plausible excuse for a rather poor performance. We got squeezed just a little but right away from the gate. We settled in going into the first turn just a couple lengths back of Empire Maker. When everybody started to pick it up inside the half-mile pole, I asked him to go ahead and improve his position and there was no response. He just kind of galloped on from there to the wire." 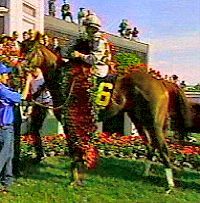 Funny Cide and Jose Santos in the winner's circle with the Derby roses. 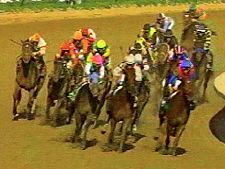 2003 Preakness Contenders - it is on to Pimlico now as we take a look at the horses currently pointed to the Preakness. Photos, profiles, and more for each possible entrant. NEW! 2003 Kentucky Oaks Results - Longshot Bird Town runs away with the Oaks over Santa Catarina and Yell while Elloluv and Lady Tak disappoint. Results, charts, and photos here. NEW! Kentucky Derby $5 Million Pay Day - a free contest from Churchill Downs where you pick the exact order of finish for the full field in the Derby to win. You can make your picks starting April 30th and if you already registered for the Road to the Roses contest, you are registered for this too. NEW! Kentucky Derby Future Wager - Pool Three, which included a separate pool for the Oaks, closed on April 6th. Get the final odds for all 3 pools plus the Oaks here.